Ian reports a cool overcast morning at Grosmont with Dave Donegan, Steve Hyman, Roy Marshall, Bill Dobson (who was a little late due to a hospital appointment) and Ian himself. Quite a contrast with the Lake District where we are basking in wall to wall sunshine from a cloudless blue sky! Back at Grosmont though, it was tea as usual then all hands on the header and main steam pipes. The two main steam pipes were hydraulically tested and are OK. But the header continues to be very frustrating. After filling with water and all the doggy balls secured, the pressure was pumped up to around a hundred pounds, but the main rubber seal behind the front plate started to pass water into the other chambers of the header, so no pressure could be retained. By the time it was stripped down it was getting late. So Bill and Ian are going down this morning (Thursday) to re-fit the seal and box it up again and complete hopefully another hydraulic test . By lunch time the weather had picked up a bit and, with the sun shining, it was lunch alfresco on the picnic benches. 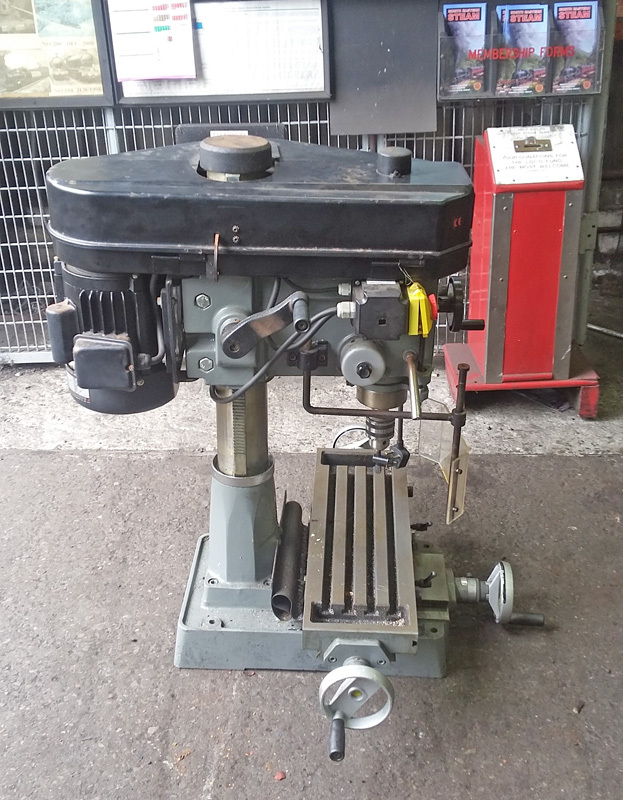 Sean Bowler has given NELPG a drilling/milling machine to be installed in Deviation workshop (see photo) for which an enormous thank you is owed to Sean. It is apparently quite a heavy piece of kit and will need at least three strong lads to lift into position. Bill would like it at the south end of the workshop, which needs a good clearing out, as there are lots of old scrap items but, among them, some good material to sort out! Royal Wedding Day today, blistering hot, so the thought was no work today - but no such luck! Trevor Wilford, Bill Dobson, and Ian Pearson (who was a late starter so missed out on the usual cuppa) decided to forego the attractions of both the Royal Wedding and the FA Cup Final in favour of the delights of Grosmont. Peter Ellis also called in for some copper pipe for SNG (60007) and then legged it to York. Bill and Trevor started boxing up the Q6 header on the saturated steam side, while Ian went down to the J27 to sort out the oil locker and put some loco tools on board - IE gauge glass spanner and a spanner for the steam oil reservoir and a screw driver, along with an adjustable spanner. He also removed a bag of large bolts which are now upstairs in Deviation Shed: does any one know what they are for? Lunch was had alfresco on the bench outside Deviation Shed. After lunch, all three worked on the header. It was lifted higher on the bench so the water hose could be connected. It was then filled with water but the three outside plug holes would not seal, so it is back to the drawing board for now! The job was abandoned at 15.45 and home everyone went. The next working party will be on Wednesday 23 May, when hopefully the hydraulic on the header will be successfully completed. The J27 was not out today, but will be on a running in turn tomorrow. All being well, it will go to Pickering on the 1630 and then formally enter service, working the 3 coach teak set on Monday, Tuesday, Wednesday, and Thursday. Well....not everything went as forecast yesterday. First, it was a lovely sunny and warm day so no need to fire up Bill's new stove after all. Then it turned out that Ian had had a fall over the weekend and damaged his shoulder so he was unable to be present - and had even had to cancel a driving turn the previous day! As a consequence, and because of my late arrival following car problems over the weekend, there were no cups of tea to start the day - except for Bill, who was there really early and managed to sneak one in. A disastrous start for what was a big team, particularly from Hartlepool, consisting of Bill Dobson, Roy Marshall, Dave Whitfield, Dave Donegan, Nigel Bill, Jon Bradley, Steve Hyman, Nigel Hall and, eventually, myself. We also had visits from Bob Grey and Derek Norris who had been for a ride out to Pickering, and Terry Newman who was on Repton for the day. In between times we did manage to get lunch, with some dining in the sun at the picnic tables up by the wheeldrop, while others stayed back in the shade on the bench in Deviation Shed. Because of a commercial filming project, services appeared to be running to the Green rather than Red timetable, with 80136 top and tailed with the Class 26 on the Gresley teaks for the filming people, and the normal service trains, which were generally very busy, in the hands of 76079 and Repton, while the B1 came in for wash out. Working party on Saturday as usual, for which milk will be required and the water bottles need filling before any cups of tea can be poured. In respect of the milk though, can I please ask that opened bottles of milk are not left sideways in the fridge - they leak and the curdled consequences have to be removed from the bottom of a very smelly fridge, along with anything else that was stored there and been affected. Please always leave the milk bottles standing upright, and buy single pints as they fit in that way. Many thanks. Ian reports a shorts and T shirt day at Grosmont on Saturday - very warm and sunshine throughout. Even so, you wouldn't believe it, but the stove was lit during the morning - Bill claimed it was just a test fire! Present were Bill Dobson, Peter Ellis, Trevor Wilford, Tom Noble, Andy and Joan Lowes, Bryan Orange and a large number of Junior Volunteers, along with Ian. Saturday was a 'Behind the Scenes Day' on the Railway with the MPD open for the general public to wander round. Our shed was very busy with people looking round. A stall was set up in Deviation Shed selling books, pens, locomotive prints and old magazines which was looked after by Joan Lowes and brought in just over £50. Andy was showing some visitors from Threlkeld Quarry and Mining Museum round the MPD and Deviation Shed. Ian and Tom got the diesel shunter started and moved the breakdown coach and van out of the way so that the Q6 could be worked on directly. Bill, Tom and Ian then fitted the right hand valve into the steam chest, involving a lot of pulling, lifting and jiggling around before it eventually went in, making sure the gland follower was on the spindle first. Then the left and right cotters were fitted. 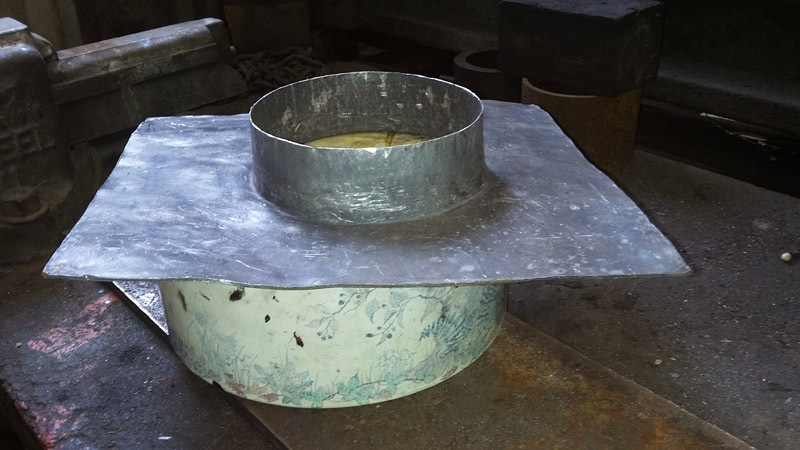 Peter and Trevor were working on the stove chimney project, making a lead seal to go around the top of the chimney and the roof to stop the rain coming in (see photo: hope the biscuits weren't still in the tin being used to stand it on!). Trevor made a cowl which will fit to an extension and then be secured to the chimney. Alfresco lunch was had on the picnic tables outside Deviation Shed. In the afternoon, Bill and Tom got ready to set the valve timing, with Ian driving the shunter, Bill measuring the valve movement, and Tom relaying the movement to Ian, resulting in a lot of back and forward movements. By 4pm Bill had finished for the time being, but there is more to do next time. Then Ian and Tom had to put the breakdown coach and van back on No 7 road. Two JV's, Tom Readman and Alex Tyson were set on needle gunning the Q6 header which Mark O'Brien had successfully removed on Thursday, and cleaning the stud threads and running a die nut down them under the supervision of Andy Lowes. Noah Hunter and Will Harrison painted the pit wall with white emulsion which Bill managed to share with his overalls! The JVs also sealed and bolted the rear section to the cab roof of the S15, along with sand blasting the cab roof fixing bolts/nuts. JV assistance was also given to needle gunning Lucie's footplate grid. The next working party will be on Wednesday 9th May, by when it might have got a bit cooler and we could need that stove! As well as finishing off the valve setting, there is all the remaining gear that can be fitted underneath now the valves are in. Mark O'Brien writes: A quick update on the header. I managed to get the Q6 back outside for a couple of hours to enable removal of the header. An hour with a set of bottles, a hammer, a bar and a chock, the header was lifted down and out of the smokebox onto the floor ready for examination of the header, studs and hydraulic test of the header. A wet miserable morning at Grosmont yesterday but the sky cleared after lunch and the sun came out. With Bill Dobson, Steve Hyman, Nigel Bill, Roy Marshall, Nigel Hall, Ian Pearson, Dave Donegan and myself for what turned out to be a very frustrating day. No mice to report again, and the usual cups of tea all round, were among the highlights. As it was lunch time, we retired to the bench in Deviation Shed, and were joined by Paul Hutchinson who had brought back the Q6 brick arch formers from Carnforth and joined us for a chat and a cuppa. Steve stacked the arch formers neatly to the left of the double doors into the workshop. After lunch, while waiting for the diesel shunter, Bill, Nigel Bill, Ian and myself took the opportunity to fit the right hand side valve back into the valve steam chest so Bill could line it up, measure and scribe and pop mark it. Chris Cubitt then took over driving the shunter for us, and the Q6 was coupled to the wagon carrying the frames of Lucie . At the same time, another diesel removed a coach from the back road behind Deviation Shed which had to be moved to the running shed where it's refurbished bogies were ready to be fitted, and also make space to get Lucie into the wheeldrop. The J27 also had to be extracted from the back of the running shed behind 80136 and 76079 and brought up to the coaling plant to wait for the arrival of the Q6 ready to go back into Deviation Shed in the right order. At least I think that was planned. By the time this was achieved it was time to move Lucie and the Q6 out side. Lucie was, in the end, put on No 8 road in front of Hartland and then the Q6 was taken to couple onto the J27. However, as the Q6 was being pushed towards the J27, the leading wheels of the Q6 tender derailed at approx 3.30pm. Shed Foreman Barney Casey, Nick Simpson and a team of shed fitters were soon on the scene with the breakdown coach alongside and the lifting jacks out. By 4.45pm the tender was back on the road. Ian assisted in a little more shunting around the shed driving the class 25 and the 08 shunter, and the J27 and Q6 were finally put into Deviation Shed and the doors shut. What an afternoon! There were some other jobs done by the team today - Nigel Hall filled and rubbed down the BR dome cover and gave it a coat of grey undercoat, and Roy, Steve and Dave brought a lot of items belonging to the J27 from the MPD, some of which are stored upstairs in the workshop and some near the bench at the back of No 8 road . Where individually identifiable they have been tagged and their location recorded on an inventory sheet, a copy of which has been given to Paul Middleton - I currently have the original which will be returned to the upstairs desk in the workshop next week. A check needs to be made of this material once the J27 is back in traffic to see what is surplus to requirements and can be scrapped. The next working party will be on Saturday 5th May, when it is the NYMR 'Behind the Scenes' weekend. The JVs will be attending with a sales and refreshments stand on the Saturday, ready to show visitors round. Hopefully the left hand side valve can be fitted to the Q6, which will then allow the brake gear and other bits to go back on. For Tuesday, the current plan is to move the Q6 down to the MPD so that the header can be removed, and the long awaited copper ferrule might arrive to enable retubing to start - we will see! Ian was driving on the NYMR yesterday, so Bill reports via Ian (yes it's a long reporting chain this time!) that it was a cool fine day at Grosmont yesterday with James Swainston, Nigel Bill, Trevor Wilford, Peter Ellis and Bill himself. After the usual cups of tea and chat, Trevor and Peter finished off fabricating the heavy duty brackets for supporting the flue for the stove. Holes were drilled in the wall of workshop, brackets fixed, and the flue tube hauled into position using the pull lift. However, there is still more work to do on this project before an initial steam test can be carried out and the stove be brought into service! On the Q6 itself, the valve setting is due to be done next week, possibly on Tuesday or Wednesday, so, in preparation, both piston valves have been removed and the port widths measured. To facilitate this, the link rod between the steam reverser and the way shaft was removed and the Stephenson link position altered with a crowbar. Some of the small tubes put in the boiler last Saturday were re-positioned to allow Mark O'Brien better access for beading over the screwed copper ferrule when it arrives in the next day or two - it has been waiting for a material certificate before being despatched, but that has now apparently been received so is on its way at last. 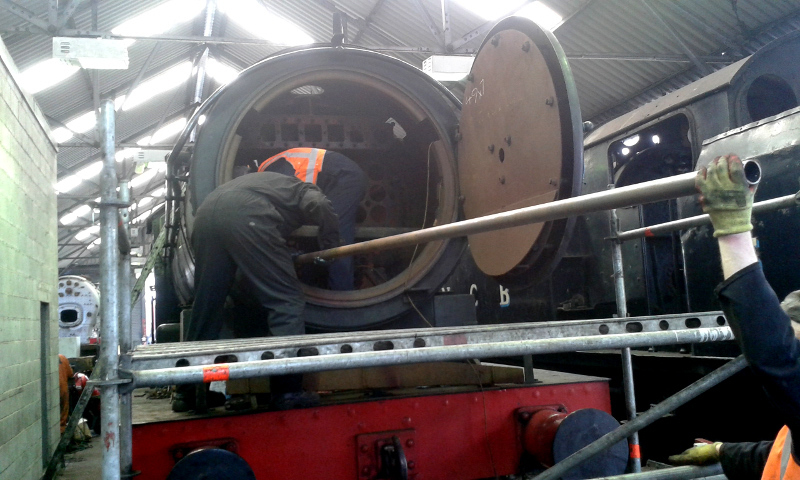 The chamfering of the flue tube holes has also been completed by the NYMR. The header remains to be removed. Mark O'Brien has been concentrating on the J27 in the last few days, but now his work on that has been largely completed he says he will get on with removing the header on Tuesday. Nigel Bill removed the defective front safety valve from the J27 and dismantled it. Bill Dobson then measured the clearances on the seat and found it will need machining to correct them. The next working Party will be on Wednesday, 2 May - fingers crossed, this should be the final month of the overhaul. A sunny and dry but rather cool day yesterday at Grosmont, with Bill Dobson, Ian Pearson, Roy Marshall, Nigel Hall and myself. Usual cups of tea to start with and discussions on what we were to do as we were waiting of a shunt with the 08 shunter. The tea club has now been extended to include Martin Ashburner and William Parrish from the Essex Loco Society, working on the boiler of 825 on No 8 Road. I brought the BR style dome cover for the J27 down from upstairs which Nigel spent the rest of the day stripping down and repainting in primer. Ian oiled up all side rods, big ends and little ends and Bill lubricated the pistons. Roy cleaned the left hand con rod, which had acquired quite a bit of rust and grime over time sat on the floor of Deviation Shed. Ian spoke to Chris Cubitt about the movement of the Q6 as he was driving the 08. There was a long list of shunts to be done before the Q6, and Ian was told it would be 1 o'clock before we could have a shunt. Bill asked Ian to disconnect the drive from the steam reverser shaft to the expansion link which he did and tied the shaft up out of the way, as it was touching the intermediate axle. Hopefully this should make it easier to set the valves, but no valve setting was done as the MPD valve setter was away. No alfresco lunch today as it was a bit too cool for sitting outside at the picnic tables, so we ate inside on the bench in Deviation Shed. Derek Shorten called in to see us during the lunch break: he is struggling to walk with arthritis in his knee joint and went for a ride out on the train to Pickering. Just after 1pm, Chris Cubitt started up the 08 "Gronk " with Josh, the diesel fitter, as shunter. After moving the crane and breakdown coach, the 08 was attached to the Q6 and, with great driving skill and communication with the shunter, it was moved very slowly to test the piston travel on both sides. These proved to be OK and lining up with the pop marks. The locomotive was then taken outside for removal of the header. After a lot of time and effort, using the telehandler with strops attached round the header and onto the tines, and in spite of a lot of help and effort from William Parrish, including use of a burning torch to heat the flange and bolts and try to break the seal, it all proved to be of no avail and we had to retire unsuccessful. The Q6 was left outside Deviation Shed and Mark O'Brien said he would have another go today once he had finished with the J27. While the Q6 was outside however, I cleaned the mechanical lubricator which was rather grubby with oil and dirt, as well as keeping an eye on progress with the J27. Next working party will be this Saturday, 28th April. 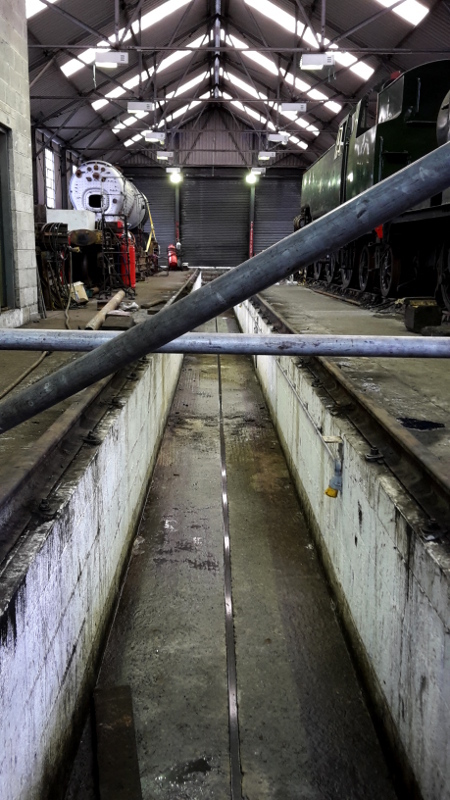 In other news, the guttering replacement on Deviation Shed has now been completed and one positive consequence has been a drying out of the pit (see Nigel Hall's photo) - the pump has not had to be used during the last three working parties. Long may it continue! On the Railway, the boiler and frames of 9F No 92134 have arrived and were moved into the running shed yesterday. It is reported to be here on the same basis as 80136 - completion (it apparently has a boiler ticket) and then running on the NYMR in return for a number of years. The B1 also returned to New Bridge yesterday following its holiday in Scotland - at least its tender was seen on a low loader heading East along the A64 near Whitwell on the Hill at about 5.45pm. In its absence, and 80136 on wash out, services were in the hands of Repton and 76079, along with the DMU. Another glorious warm sunny day at Grosmont, with Bill Dobson, Trevor Wilford, Ian Pearson, Dave Donegan, James Swainston, myself (I know, it wasn't Wednesday! ), and, for the first time, Paul Jameson for half a day as he was on a photographers PTS course in the afternoon, then Alan Hardie in the afternoon after his training course in the morning, and Paul Swainston after lunch following his cleaning turn. First job was to brew up the usual cuppas for the team to get them motivated. No cakes today though. Then it was all hands round the east side of Deviation Shed to unload the 24 new Q6 elements off the NYMR's Transit pickup truck which Bill and Ian had brought back from Ian Storey Engineering at Hepscott on Friday (see photo). These are now safely stacked on the footway between Nos 6 & 7 roads in Deviation Shed. Trevor spent all day making more fittings and getting the stove flue ready for erection in the near future - we are clearly not expecting the current warm weather to last! Trevor had to get another oxygen bottle from the compound as ours had run out: the empty was returned to the compound. Bill brought the LHS big end bearing up from the MPD and with me, Paul J, Dave and James, the bearing was finally fitted. Final adjustments will wait until valve setting is done, as moving the locomotive and tender backwards and forward proved too much of a challenge in the heat. Lunch was had alfresco at the picnic table in the lovely warm sunshine - just like being in Mallorca with steam trains passing by! 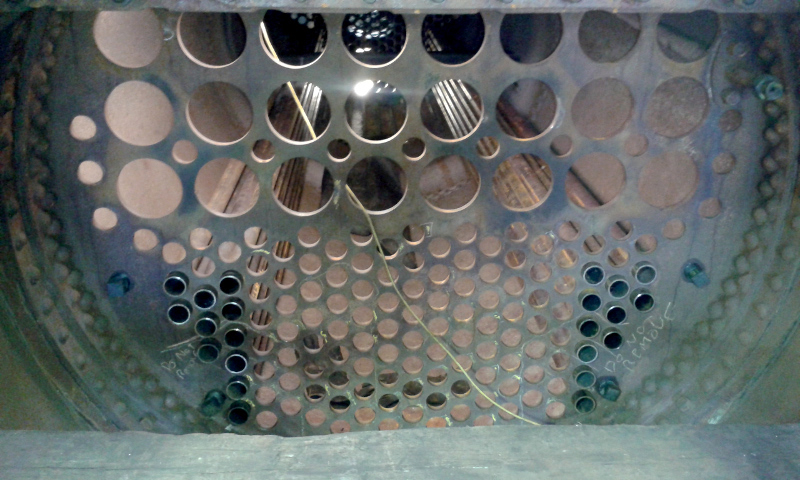 After lunch it was decided to erect staging at the front of the Q6 so we could put some small tubes into the boiler. 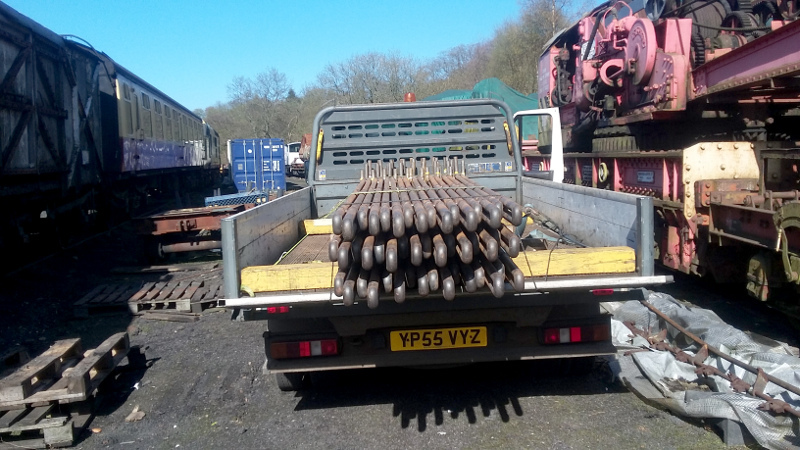 That required all hands on erecting the staging, and, as we were up and down to the MPD boiler shop for staging parts, the opportunity was taken to move all the J27 cab flooring down to the boiler shop on our return journeys. It has been stacked adjacent to the locomotive. With James inside the boiler, as he was the slim one yesterday in the absence of Rachelle, 22 small tubes were fitted into the boiler, 11 each side bottom right and left (see photos). Only 134 to go! On the J27 side of things, the water valve handles from the tender, from which Nigel had started to remove the remnants of taper pins last Wednesday, were drilled out by Dave Donegan. The right hand handle was fitted to the spindle and a split pin put in to secure it but was not opened out. The left hand handle is fastened to its spindle with a piece of wire at the moment, as this requires a small hole drilling in the spindle and then split pinning. We did have a lot of visitors round the Shed today, also quite a lot of new and older JV's around the MPD learning the ropes. The new compressor was in constant use by Piglet shot blasting Lucie's frames, and 80136 was on the 1230 'Wedding Belle' departure from Grosmont, and we gave the lucky couple a toast with our tea as the train came past the Shed. Well, what a change in the weather! 20 degrees at Grosmont today so we needed to watch for sunburn rather than worrying about having to wrap up to keep warm. Bill Dobson, Steve Hyman, Jon Bradley, and Ian Pearson at the start of the day, I arrived around lunch time following a dental appointment, and Nigel Hall came in about 2pm. Chris Wakefield also joined the team for a couple of hours after his cleaning turn. So the usual cups of tea, and still no mice. 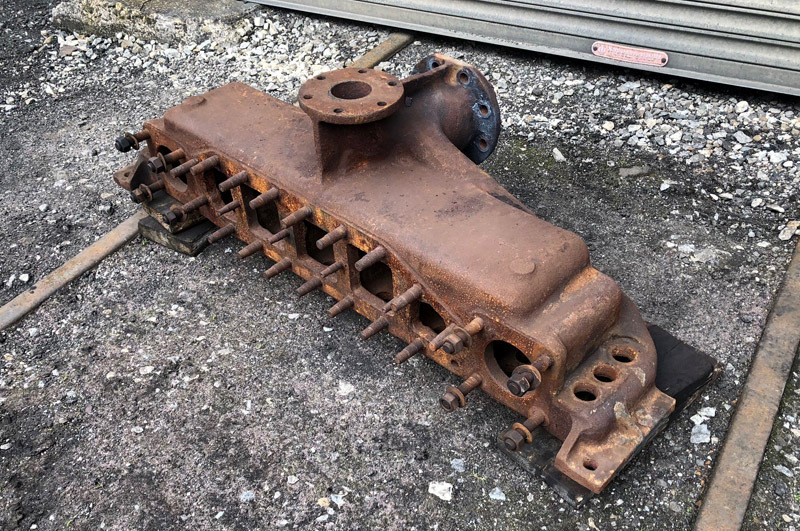 It was decided that Bill would fit all the remaining washout plugs, while everyone else would remove the tender and locomotive drawbar hooks for NDT inspection. This was going to be a lengthy job as both drawbar hooks were covered in grease and about 3 coats of paint. A collective effort was organised, with Jon and Steve removing the hooks, and Ian cleaning all the dirt off before removing the paint with a wire brush attachment on the angle grinder. Chris Wakefield carried on with the angle grinder, removing rust and paint while lunch was held alfresco in the picnic area just outside Deviation Shed. After lunch we had a visit from Maurice Burns and his partner Mary who is a visitor guide at Tees Cottage Pumping Station in Darlington. 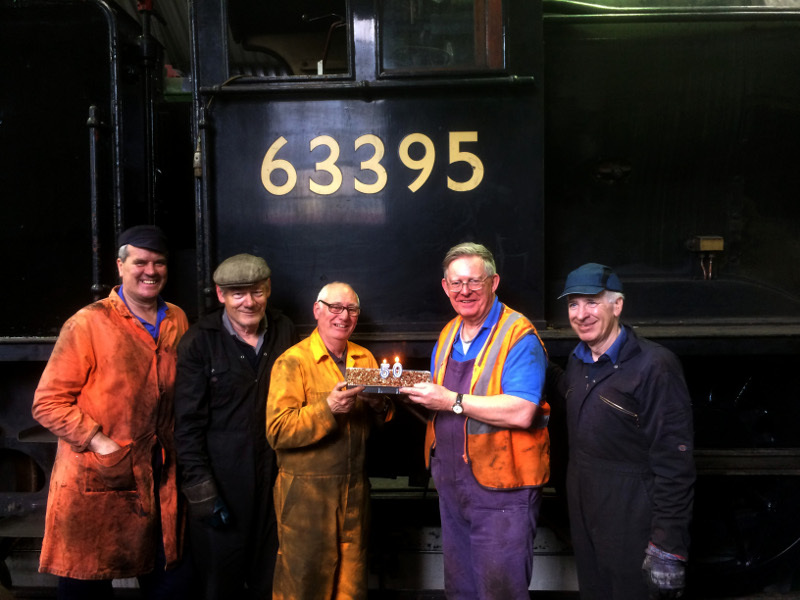 When I arrived at Deviation Shed I brought a birthday cake to mark 50 years since the Q6 was purchased by the Group on 1 April 1968. Everyone had a piece of cake to celebrate the event. Afterwards I took Maurice and Mary down to the MPD to have a look round the J27. Nigel was busy removing sheared taper pins from the tender water valve handles belonging to the J27. These had to be drilled out and will be refitted next week. At the end of the day, Ian having successfully NDT'd the draw hooks, they were refitted back on the engine and tender, while Bill completed fitting all washout plugs in the cab, foundation ring and smokebox. Quite a few visitors round the Shed today although it was very noisy at times with William Parrish beading over copper rivets on the S15 boiler situated on No 8 road. Bill and Ian are going to Ian Storey's workshop at Hepscott on Friday to pick up the superheater elements for the Q6. Hopefully they will be dropping off the old J27 smokebox wrapper at the Marske scrapyard on the way. 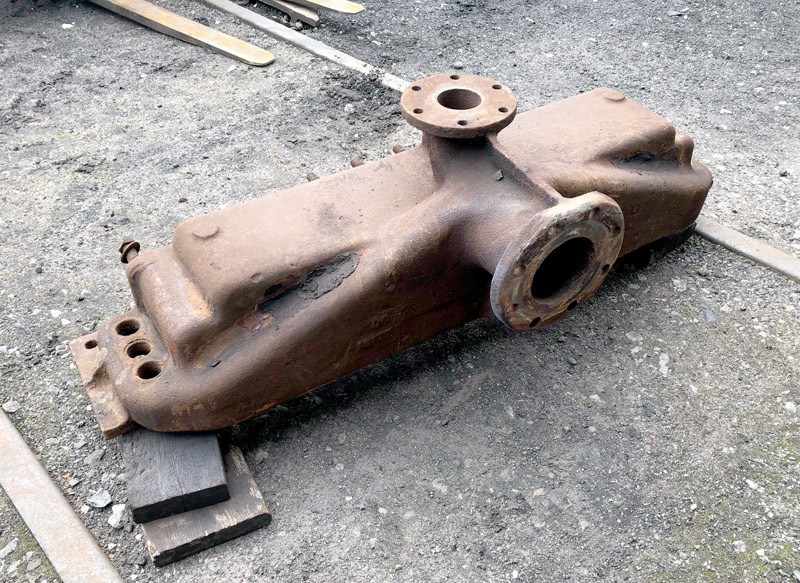 The next working party will be on Saturday 21st, when the big end bearing will be ready for fitting - by the end of today it needed only about half an hour or so's machining work.